Gladstone - Oquawka High School "Hawks"
The village of Gladstone (population 284) is located on Il. Route 164 one mile north of US. Route 34 in northern Henderson County. Other location landmarks include being approximately 20 miles southwest of Monmouth and five miles east of the Mississippi River. The A, T & SF Railroad runs through town and the South Henderson Creek also is a part of the village's history. The city of Oquawka (population 1,539) is situated on the banks of the Mississippi River in far western Henderson County. Il. Route 164 is the main highway in town. A larger town of note in the area is Monmouth which sits 16 miles east of Oquawka. Both towns supported their own high schools through the late in 1940s. 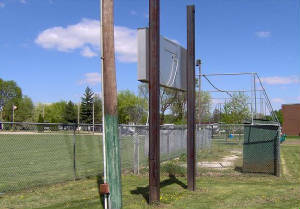 It was in the fall of 1949 that a consolidation effort took place and the Gladstone / Oquawka School District was initiated. This District lasted for eleven years. In 1960 Gladstone - Oquawka HS consolidated with Biggsville and created the Union School District. 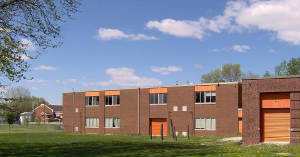 The Gladstone - Qquawka HS building still stands proudly, though now used for storage purposes. 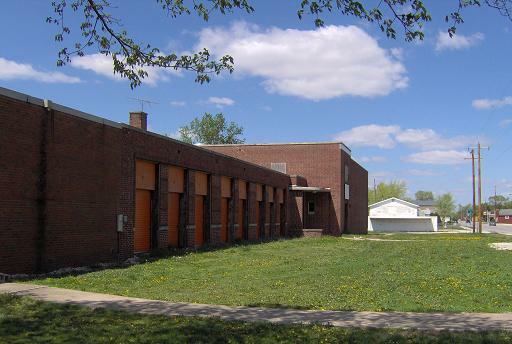 The original Gladstone high school gym is across the street from the old G & O HS/Tri-valley middle school buildings that are shown above. 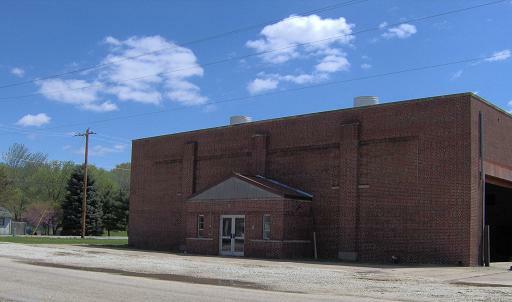 The gym is connected by the Gladstone grade school that was built in 1969. The following is information regarding the successes of the Gladstone / Oquawka High School basketball team. Two District titles and two excellent records were acheived in what might have been their short time together. The successful seasons of the G.O.H.S. boys are listed below. We belive the school offered track and possibly baseball as well. The Gladstone / Oquawka boys were a real threat in the 1950s. Two DIstrict titles and two twenty-win seasons highlighted the short history fo the school. Their boy's basketball success is listed below. The better grid-iron teams of the 1950s are listed below, as researched by our good friend Tom Sikorski. G-O last fielded a football team in 1959. Consolidated with Biggsville in 1960. Coaches of the 1950s included Mr. Vern Chick and Mr. Ziggie. "Glad to see your site. I attended G-O High School from the fall of 1955 until graduating in 1959. It was my pleasure to play on some of those very good basketball teams. I am very proud that our senior record of 27-3, a school record at the time, has never been equalled. Here are a few more basketball facts that I hope you can include in your online annals. 1958-1959 Basketball 27-3 under Coach Joe Reynolds, who was elevated to the head spot after two years as frosh-soph mentor. Coach Reynolds had a great run of teams for about seven years. Our outstanding players were 6'4" Bill Graham and 5'7" Bob Schulze. Our three losses were to New Boston (an upset), Alwood (Alpha & Woodhull) and Roseville, who were both a little better than us. I still have the box scores from most of that season's games. Bob Schulze hit a season high of 35 points against Biggsville High, a strong opponent. The Valley Conference, of which we were members at this time, was made up of the following high schools: Gladstone-Oquawka, Stronghurst, Biggsville, Media, Kirkwood, Little York, Keithsburg, New Boston, and after 1957, Warren (rural area surrounding Monmouth). None of these schools still exist. G-O had probably the largest enrollment, around 125, while Media was the smallest with an enrollment of about 70. I believe all except New Boston & Keithsburg fielded football teams. In the early '50s, G-O participated in 8-man football. One other note: In my memory, no G-O players had notable college success, but one man deserves mention as arguably the best player of the school's 12 year run: 6'6" Marlin McCabe (Class of '55) was an outstanding player who anchored at least one district championship team. Marlin played briefly for Western Illinois University. Thanks again for maintaining this site. I have great memories of my high school basketball days. I later played at Eureka College and coached for 24 years.